"California Poppy" redirects here. For the album by OPM, see California Poppy (album). For the British speedway team, see California Poppies. It is a perennial or annual plant growing to 5–60 in (13–152 cm) tall with alternately branching glaucous blue-green foliage. The leaves are alternately divided into round, lobed segments. The flowers are solitary on long stems, silky-textured, with four petals, each petal 2 to 6 cm (0.79 to 2.36 in) long and broad; flower color ranges through yellow, orange and red (with some pinks). Flowering occurs from February to September in the northern hemisphere (spring, summer, fall). The petals close at night (or in cold, windy weather) and open again the following morning, although they may remain closed in cloudy weather. 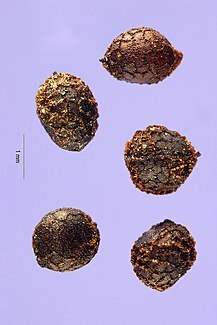 The fruit is a slender, dehiscent capsule 3 to 9 cm (1.2 to 3.5 in) long, which splits in two to release numerous small black or dark brown seeds. It survives mild winters in its native range, dying completely in colder climates. Its native habitat includes California and extends to Oregon, Washington, Nevada, Arizona, New Mexico, Sonora and northwest Baja California. 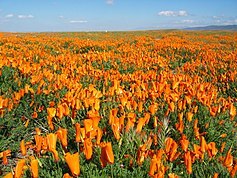 The Antelope Valley California Poppy Reserve is located in northern Los Angeles County. At the peak of the blooming season, orange flowers seem to cover all 1,745 acres (706 ha) of the reserve. Other prominent locations of California poppy meadows are in Bear Valley (Colusa County) and Point Buchon (San Luis Obispo County). Eschscholzia californica was the first named species of the genus Eschscholzia, named by the German botanist Adelbert von Chamisso after the Baltic German botanist Johann Friedrich von Eschscholtz, his friend and colleague on Otto von Kotzebue’s scientific expedition to California and the greater Pacific circa 1810 aboard the Russian ship Rurik. Maritime poppies, E. californica subsp. californica var. maritima (E. L. Greene) Jeps., Cambria, California. E. californica subsp. californica, native to California, Baja California, and Oregon, widely planted as an ornamental, and an invasive elsewhere (see below). E. californica subsp. californica var. californica, which is found along the coast from the San Francisco Peninsula north. They are perennial and somewhat prostrate, with yellow flowers. E. californica subsp. californica var. maritima (E. L. Greene) Jeps., which is found along the coast from Monterey south to San Miguel Island. They are perennial, long-lived, glaucous, short in stature, and have extremely prostrate growth and yellow flowers. E. californica subsp. californica var. crocea (Benth.) Jeps., which grows in non-arid inland regions. They are perennial, taller, and have orange flowers. E. California subsp. californica var. peninsularis (E. L. Greene) Munz, which is an annual or facultative annual growing in arid inland environments. A UK study of meadow flowers that focused on commercial mixes, but which also tested various common weeds such as ragwort and dandelion, ranked the California poppy highly in pollen production, although it did not produce a significant amount of nectar. On a per-flower basis it ranked second, with a rate of 8.3±1.1μl. The corn poppy, Papaver rhoeas, topped the list for per-flower pollen production with its rate of 13.3 ± 2.8μl. When measuring the entire capitulum the top two species were the ox-eye daisy, Leucanthemum vulgare, with 15.9 ± 2μl, and Cosmos bipinnatus, which had a rate nearly equivalent to that of the corn poppy. As poppies are not wind-pollinated, their pollen poses no allergy risk via inhalation. California poppy leaves are used as food or garnish, while the seeds are used in cooking. Because of its beauty and ease of growing, the California poppy was introduced into several regions with similar Mediterranean climates. It is commercially sold and widely naturalized in Australia, and was introduced to South Africa, Chile, and Argentina. It is recognized as a potentially invasive species within the United States, although no indications of ill effects have been reported for this plant where it has been introduced outside of California. The golden poppy has been displaced in large areas of its original habitat, such as Southern California, by more invasive exotic species, such as mustard or annual grasses. In Chile, it was introduced from multiple sources between the mid-19th century and the early 20th century. It appears to have been both intentionally imported as an ornamental garden plant, and accidentally introduced along with alfalfa seed grown in California. Since Chile and California have similar climatic regions and have experienced much agricultural exchange, it is perhaps not surprising that it was introduced to Chile. Once there, its perennial forms spread primarily in human-disturbed environments (Leger and Rice, 2003). 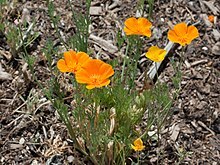 The introduced Chilean populations of California poppy appear to be larger and more fecund in their introduced range than in their native range (Leger and Rice, 2003). Introduced populations have been noted to be larger and more reproductively successful than native ones (Elton, 1958), and there has been much speculation as to why. Increase in resource availability, decreased competition, and release from enemy pressure have all been proposed as explanations. One hypothesis is that the plant's resources devoted in the native range to a defense strategy can, in the absence of enemies, be devoted to increased growth and reproduction (the EICA Hypothesis, Blossey & Nötzold, 1995). However, this is not the case with introduced populations of E. californica in Chile: the Chilean populations were actually more resistant to Californian caterpillars than native populations (Leger and Forister, 2005). 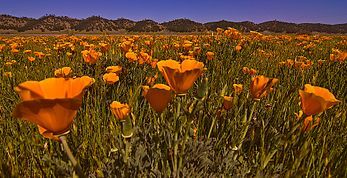 During the 1890s Sarah Plummer Lemmon advocated for the adoption of the golden poppy as the state flower of California, eventually writing the bill passed by the California Legislature and signed by Governor George Pardee in 1903. It was selected as the state flower by the California State Floral Society in December 1890, besting the Mariposa lily (genus Calochortus) and the Matilija poppy (Romneya coulteri) by a wide margin, but the state legislature did not make the selection official until 1903. Its golden blooms were deemed a fitting symbol for the Golden State. April 6 is designated as California Poppy Day. As the official state flower of California, Eschscholzia californica is pictured on welcome signs along highways entering California and official Scenic Route signs. To commemorate Meghan Markle's Californian origins, Clare Waight Keller included the golden poppy in the embroidery of Markle's wedding veil. It is also included in the Duchess of Sussex's coat of arms, displayed with wintersweet in the compartment. ^ a b "Eschscholzia californica". Royal Horticultural Society, Plant Selector, RHS Gardening. ^ a b "California poppy, golden poppy, copa de oro". Florida Museum of Natural History, University of Florida. Retrieved April 9, 2012. ^ Hicks, DM; Ouvrard, P; Baldock, KCR (2016). "Food for Pollinators: Quantifying the Nectar and Pollen Resources of Urban Flower Meadows". PLoS ONE. 11 (6): e0158117. Bibcode:2016PLoSO..1158117H. doi:10.1371/journal.pone.0158117. PMC 4920406. 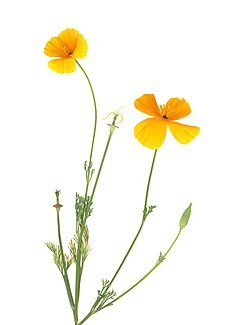 ^ "Eschscholzia californica - Cham". Plants for a Future. 2012. Retrieved 8 May 2018. 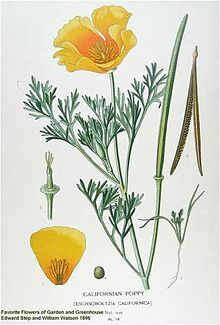 ^ "Eschscholzia californica". Missouri Botanical Garden. 2018. Retrieved 8 May 2018. ^ "AGM Plants - Ornamental" (PDF). Royal Horticultural Society. July 2017. p. 37. Retrieved 18 February 2018. ^ "Eschscholzia californica 'Apricot Chiffon' (Thai Silk Series)". Royal Horticultural Society, RHS Plant Selector. 2018. ^ "RHS Plant Selector Eschscholzia californica 'Dali' AGM / RHS Gardening". Apps.rhs.org.uk. Retrieved 15 September 2018. ^ "RHS Plant Selector Eschscholzia californica 'Rose Chiffon' (Thai Silk Series) AGM / RHS Gardening". Apps.rhs.org.uk. Retrieved 15 September 2018. ^ "Sara Allen Plummer Lemmon (1836–1923)", Find-a-Grave. ^ Michael Redmon, "Who is responsible for setting up Santa Barbara’s first library? ", Santa Barbara Independent, April 10, 2008. ^ "California Beat Hero: Sara Plummer Lemmon – California Beat". Retrieved 2016-12-13. ^ "California Government Code §421". State of California. Retrieved April 14, 2012. ^ "The Wedding Dress, Bridesmaids' Dresses and Page Boys' Uniforms". Royal.uk. 19 May 2018. Retrieved 15 September 2018. ^ "Her Royal Highness The Duchess of Sussex: Coat of Arms". Royal.uk. 25 May 2018. Retrieved 15 September 2018. Blossey, B.; Nötzold, R. (1995). "Evolution of increased competitive ability in invasive non-indigenous plants: a hypothesis". Ecology. 83: 887–889. doi:10.2307/2261425. Elton, C. S. The ecology of invasions by animals and plants. Chapman & Hall, London. Leger, E. A.; Rice, K. J. (2003). "Invasive California poppies (Eschscholzia californica Cham.) grow larger than native individuals under reduced competition". Ecology Letters. 6: 257–264. doi:10.1046/j.1461-0248.2003.00423.x. Leger, E. A.; Forister, M. L. (2005). "Increased to generalist herbivores in invasive populations of the California poppy (Eschscholzia californica)". Diversity and Distributions. 11: 311–317. doi:10.1111/j.1366-9516.2005.00165.x. 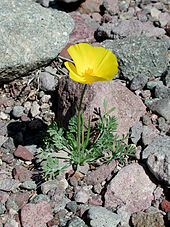 Wikimedia Commons has media related to Eschscholzia californica.